Advisor Multi Ilan 2014 is designed to work simultaneously on several currency pairs (listed below), the list of which is provided in the outer parameters of the advisor. Advisors from Series Ilan are perhaps the most popular trade experts on the internet. We present to your attention yet another version – highly recommended by traders. Lets introduce, the name of advisor is Multi Ilan version 2014 and we, of course, could not pass by such a robot. This forex advisor became much more independent: now you don’t need to care as much about it as you needed before, less “manual» work for the trader. So, in the opinion of its traders that tested it – this is the best Multi-Currency expert in 2014. Multi Ilan 2014 operates synchronously on 9 forex pairs, which gives a significant advantage for getting a lot more profits than in the previous year’s earlier versions. Function of hedging of currency pairs is built into the expert, and even if the transaction is closed by the stop, it remains profitable. How is that possible? When the price goes above the purchase, Multi Ilan 2014 immediately rearranges the stop without loss. The installation of this trading advisor is simple, although it is installed on each currency pair separately. This makes it possible to open the orders correctly. When working the principle of multi-currency hedging is used, which can significantly reduce the risks when trading. Fundamental factor in the formation of profit of Advisor Multi Ilan 2014 is the use of the theory of Martingale using some methods of technical analysis in the initial choice of the direction and the opening of the first market transaction. All subsequent series of transactions are opened in the same direction and are opened in the market. The trading robot automatically analyzes the type of account and multiplies, if necessary, the parameter data by 10 (five-digit accounts). For the first order advisor uses indicator Relative Strength Index, and the next orders are opened in the same direction with the help of Relative Strength Index and MA. We recommend to use Advisor Multi Ilan 2014 with next settings: MATimeFrame- 1H TF_Indicator 15m-30m. If ModeIndividual=«TRUE», the optimization on the history and management of automated online system is enabled. Step Martingale is specified manually in the settings, which also is an advantage of Multi Ilan 2014. You can also use a trailing stop and do so that there is no loss for fixing already received floating profit at a certain level. Using the same account with other advisors is unacceptable. This version of Ilan can withstand 1000 points( on one currency pair) because other currency pairs at the time will give profit. When using normal money management (RiskProc=15), you can gain 5-10% per month, it is quite safe – it is possible to gain 30% per month with little or no risk. Attention, it is not recommended for CoefLots to be more than 15 (it is recommended to be put 1.2-1.3). • Coef_MA – participates in calculations, therefore, if you increase TakeProfit0 and TakeProfitN from 60 and for example to 120 and do not touch the settings of MATimeFrame then Coef_MA is recommended from 8 to 12, if you change the period of MA for example from 1H to 30m and TakeProfit0 and TakeProfitN=60 then Coef_MA changes to from 8 to 12. It has been observed that the usual currency pair USD / CHF is not particularly good for Multi Ilan Advisor, so you can slightly change the default set of currency pairs. Here we have in mind that it is best to prohibit him from working on the USD / CHF so he won’t “complain” there not being additional currency pairs involved. You’ll need to put Multi Ilan Advisor on NZD / USD, EUR / GBP, EUR / CHF graphs and, in settings, prohibit Advisor from live trading. 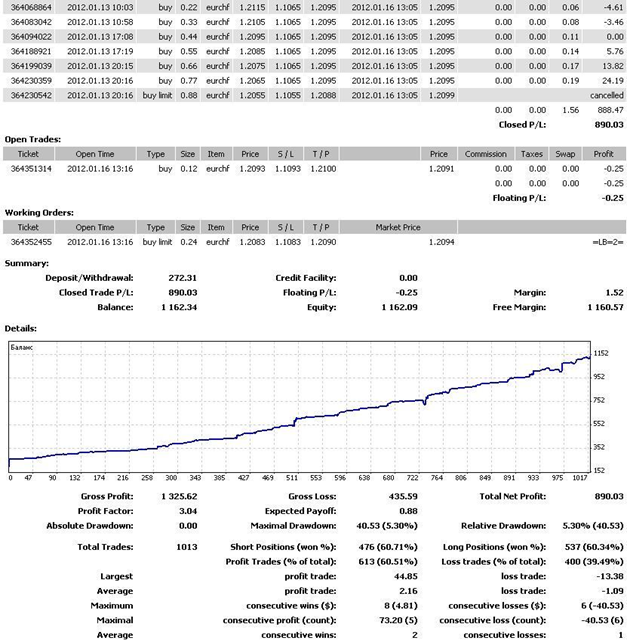 How do I prevent Advisor from working with a particular forex pair? As said above, remove in the settings checkbox «Allow live trading» and thats all. Note that in this expert tester cannot be checked because it works on nine currency pairs. The tester cannot take into account the fact that the expert works on 9 currency pairs, in addition, the tester doesn’t take hedging into account. Please note that it is best to try Advisor on demo account first, and only if you like, you can try it on a real account. Write your comments, reviews and questions to ilannext@gmail.com; the author of Advisor is going to answer all the questions. Share Multi Ilan 2014 with friends!